See the video of Dan, his son Danny (the blonde), and Danny's cousin, Jeffery, making their favorite breakfast, Wagon Wheels. Click here to watch the video. If you have a slow Internet connection, click here to see lower-quality video clip. Cut a hole in the middle of a slice of bread using a small cup. Remove the circle. Melt butter in a frying pan and place the slice of bread in the pan. 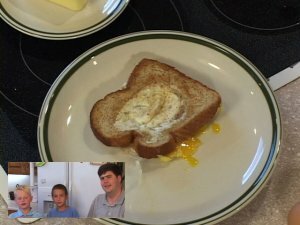 Crack one egg into the hole in the middle of the bread. Remove egg shells :). Salt and pepper as desired. Fry until the bottom is cooked then flip. Cook until the egg is to your desired doneness. Remove from the pan and serve. When you finish cooking the eggs, cook the "Wagon Wheels" or holes that you cut out in the pan by placing them on the pan. Flip to brown both sides and serve with jam.